The story of W. G. Cornell was summarized in this notice from the journal, Domestic Engineering, vol. 94, no. 7, 12 Feb. 1921, p. 341, "W. G. Cornell, president and one of the founders of the W. G. Cornell Co., plumbing contractors in New York and other cities, died at his home in Neponsit, Long Island, N. Y., on Wednesday, February 2, after a short illness of pneumonia. Wilson G. Cornell was born December 10, 1863, in Bedford County, Pa. He received his early high school education in Altoona and there also learned the plumbing trade. In 1887 he went from Altoona to Kansas City, where he was employed by D. M. Quay on large buildings, which were being erected by Norcross Bros. In 1890 he went from Kansas City to Chicago and became associated with D. M. Quay in business. While in Chicago his company did the plumbing contracts on many of the largest buildings then in course of erection by D. H. Burnham Company and Holabird & Roche, architects, and George A. Fuller Company, builders. Later Mr. Cornell came to Boston to handle the plumbing work on the large Boston Terminal for Norcross Bros. In 1895 he severed his connections with Mr. Quay and became the Boston manager of the Wells & Newton Company, in which capacity he built up a large plumbing business in Boston. In 1898 he came to New York and became a third owner of the Wells & Newton Company and manager of their plumbing department. While a member of this company such large plumbing installations were awarded to him as the Plaza Hotel, City Investing Building, Hudson Terminal and Trinity Buildings. On August 23, 1898, he severed his connections with the Wells & Newton Company and on September 1, with his surviving associates, Edward Slosson and George W. Simons, forged the W. G. Cornell Company. As president of this company and under his management the Cornell Company developed and expanded into one of the largest concerns of its kind in the country with offices in twelve of the most important cities throughout the Eastern States. In the course of its growth the Cornell Company was awarded some of the largest and most important plumbing contracts in the world, such as the Pennsylvania and Commodore Hotels, Woolworth Building, Municipal Office Building and the Army and Navy Building, Washington, D. C. Mr. Cornell was a man of unusual high moral character and integrity, great executive ability and rare business judgment; that he inspired confidence with the leading architects and builders of the country is evidenced by the growth of his business. He is survived by his wife, four children and one brother." Some contrary evidence to the glowing account above is this story from the New York Times, "W. G. Cornell & Co., plumbing contractors, were fined $10,000 by Supreme Court Justice John V. McAvoy yesterday after pleading guilty to violating the Donnelly anti-trust law, and Edward L. Slosson, Vice President, was sentenced to ten days in the City Prison for the same offense. The fine was the heaviest imposed on any of the fifty-two individuals and corporations indicted on similar charges as a result of their affiliation with John T. Hettrick's code of practice. The firm is one of the largest in the United States, has branches in several cities and did 43 per cent. of the total business of members adhearing [sic] to the code of practice." The chronology of Wilson Cornell's presence in New York as given above may be slightly inaccurate. New York city directories record him as a plumber in New York from 1901, and as an officer in the Wells & Newton Co. from 1904 to 1908. 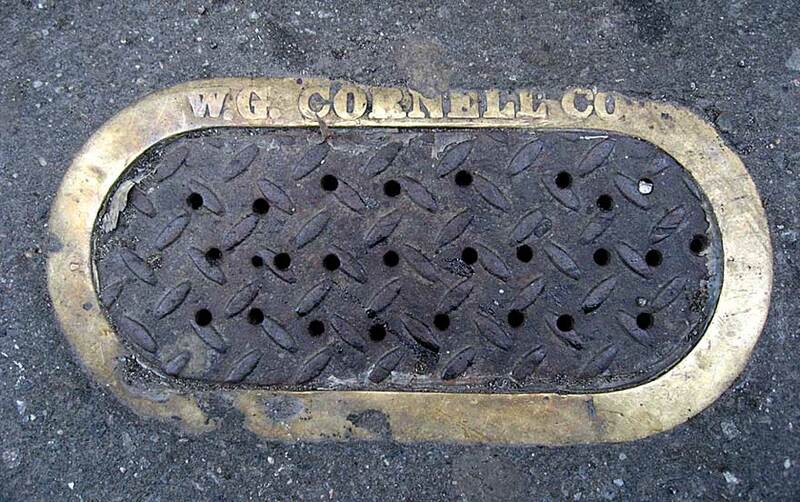 W. G. Cornell Co. seem to have been formed in 1908. From approximately 1909 to 1925 W. G. Cornell & Co. occupied offices in the Everett Building (a New York City landmark) at the corner of 4th Ave. and 17th St. on Union Square. This ad for W. G. Cornell Co. appeared in Polk's New York City Directory, 1916. The company was listed in the Manhattan telephone directory as plumbing and heating contractors through 1938. In 1928 this short notice appeared in the Times about Edward Slosson, "Edward Slosson, 52, member of the contracting firm of W. G. Cornell, died Sunday at his home in Riverside, Conn. He was a member of the Greenwich Country Club. He is survived by his widow and three sons." In July, 1939, George J. Simons received somewhat longer notice in the Times. "George J. Simons, vice president of the W. G. Cornell Company, New York plumbing contractors, died yesterday at his home, 56 Beach Knoll Road, Forest Hills, Queens. He was 70 years old and had been suffering from a heart ailment. Mr. Simons supervised the installation of plumbing equipment in some of the city's tall buildings, including the Woolworth Building, the Hotel Commodore, the Pennsylvania Hotel, the Columbia-Presbyterian Medical Center, the Equitable Building, the Standard Oil Building and the new Metropolitan Life Insurance Building. Surviving are his widow and a son, Walter J." This ad for W. G. Cornell Co. appeared in the Yearbook of the New York Society of Architects, 1916. This one appeared in same organization's 1922 year book. The telephone number is the same, but Edward Slosson has replaced Wilson G. Cornell as president. This ad for W. G. Cornell appeared in Golf Illustrated, April, 1920.